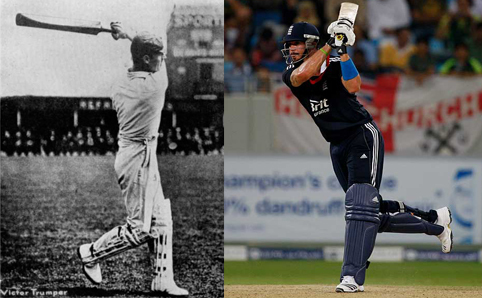 There is very little that is new under the sun, but when Third Man first saw Kevin Pietersen stand up to drive, slap the ball and do so on one leg, ending the shot like a pink flamingo, he thought he was seeing originality. 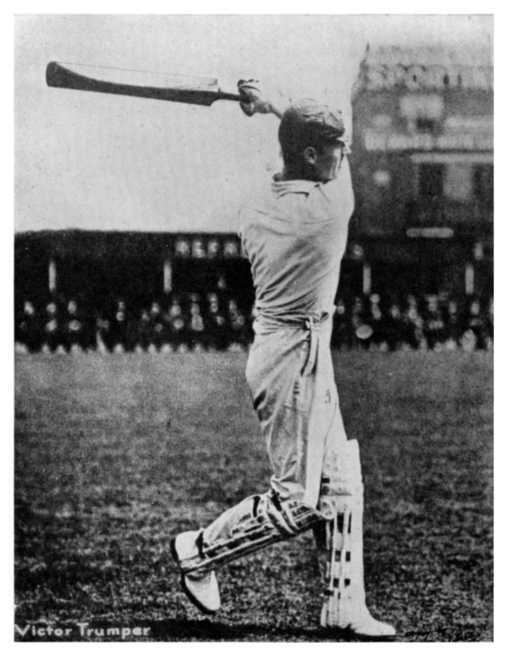 The photograph of Victor Trumper – not the usually published one of the Australian stepping with a large reaching stride down the wicket, but the one shown above alongside Pietersen – suggests that Trumper was revelling in this same shot over one hundred years ago. His fellow Australian and sometime captain, M.A. 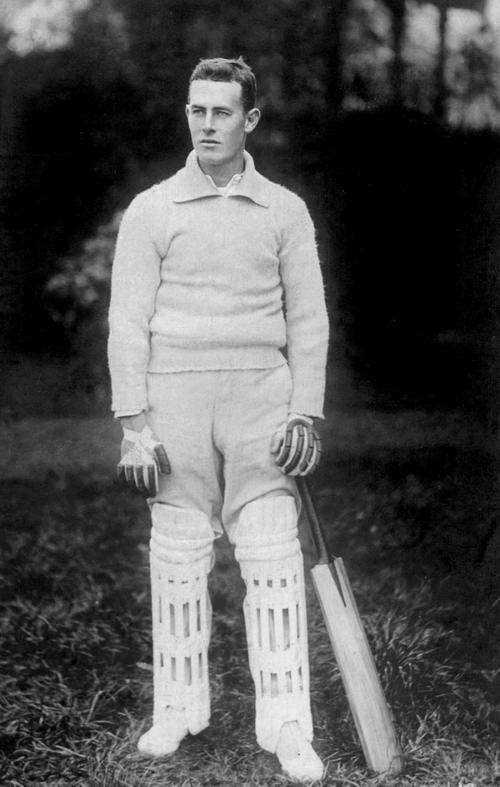 Noble in The Game’s the Thing describes how Trumper ‘would surprise the bowler by going across the wicket and ‘with a straight bat, hit the good length ball on the rise outside the off-stump with great force and along the ground between mid-on and square leg’. Noble could be describing the surprise felt by England when they first met Pietersen in South Africa or the shock he produced in county bowlers meeting him for the first time for Nottinghamshire. Pietersen was, at least until now, a restless innovator of the Trumper mould even if their temperaments characters were very different. Yesterday, during the rain break in the West Indies’ ICC T20 reply to England’s 191, the Sky commentariat of Atherton and Knight welcomed England’s dynamism but failed to see that England’s most dynamic batsman was actually far more static than we have ever seen him before. It was noticeable that against the West Indian spinners’ his forward press – in fact all initial movement – had gone and the once considerable press followed by step-across to both spin and pace had all but disappeared. These movements may have caused him to have to play across his pad to left arm spin, but in 2005 they were no handicap to him dominating the leg spin of Warne. Third Man hopes that Pietersen’s recent trials especially against left arm finger spin are not leading him to forsake his ‘versatile and virile comprehension of batting possibilities’. That road leads to orthodoxy and passivity. In Pietersen cricket has had an inventor with the freedom and confidence to innovate, to move the game forward, to inspire young cricketers to copy and enjoy the thrill of his innovations, to know the immense satisfaction of creating possibilities. It would be tragic if the game was turning him into another manager. It may have been to play more T20 yet there was something reassuring in seeing all the Sri Lankans back in their own bright blue pyjamas and the black caps all back in their … er, black caps which confirmed that there is something special about playing for or watching your country and suggested that IPL20 was a practice camp for the ‘real’ tournament that began so well in the gentler surroundings of the aptly named Providence Stadium, Guyana, yesterday evening. There was also something wonderfully democratic about the ICC’s tournament when it brought to the same pitch if not to the same match the most experienced and subtlest bowler of left arm finger spin practicing the skill today, Daniel Vittori, and the world’s youngest and least experienced, George Dockrell . In the second match of the night Dockrell for Ireland aged 17 years 283 days humbled the West Indian batting taking three wickets for 16 in his four overs. His victims included the considerable Sarwan and the devout Fletcher. 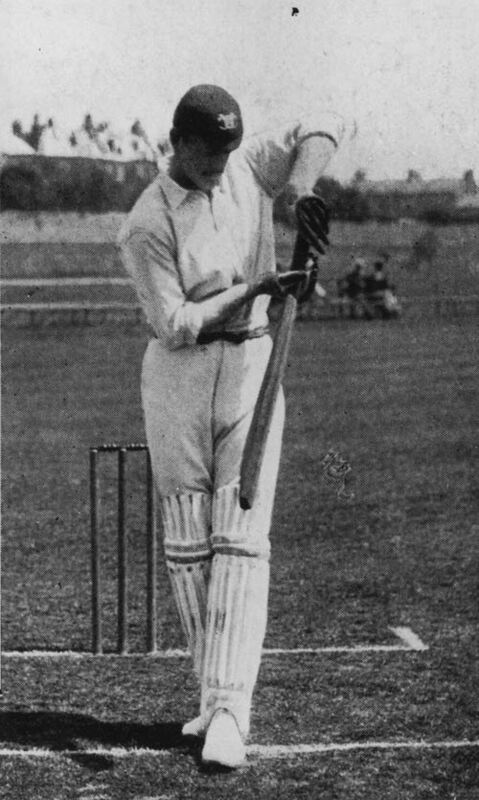 A tall bowler who surrenders much of this height with a slightly faltering and round armed action, Dockrell exploited the slow pitch. The more qualified international batsmen found it difficult to force him off the square without mis-timing their shots for comfortable catches. But it was Vittori as captain that set up the moment of the night for Third Man. 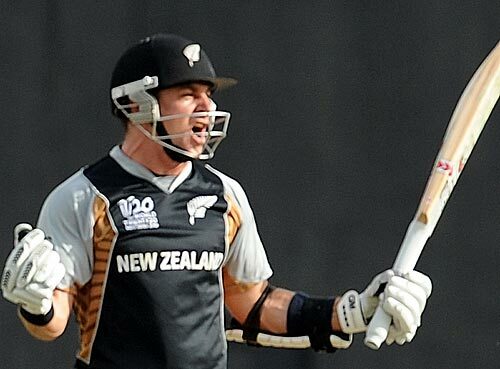 The Black caps had kept Sri Lanka to 135 (Vittori 0 – 23) and had reached 126/7 off their first 19 overs. Ten to win and nine to tie, then, with Nathan McCullum (four from 2) on strike to face one of the world’s best last over bowlers, SL Malinga. Facing only his third ball McCullum receives the expected yorker which he plays well to mid-on for one. Vittori misses the second ball but they run and complete a desperate bye as the old hand behind the stumps, Sangakara, rediscovers his nine year old self and as if playing in a game of pairs cricket chooses not to run in and take the bails off but to roll the ball at the wicket from just a few feet and misses. Even this effusive description does not do justice to this shot. Facing an extremely fast round arm bowler of usually late inswinging yorkers this young allrounder steps across to the off side and somehow manages to hit the ball in the opposite direction to the leg side boundary where the ball dissects two men kept deep on the leg side to guard especially against outcome. There are those whose opinion Third Man values who say they are ‘just not into Twenty20’. The excellent 99.94 recently described the IPL with searing penetration as one of those themed shopping malls where you can sit in a plastic Venetian Square and eat pasta ‘as if’ you were in a Venetian Square eating pasta in a post modern way. But there may be something more on offer. Watching the development of stroke play and bowling in the incubator that is T20 is like a historian of Roman life finding the ruins of Pompeii. The historian can become archaeologist. One can read about the Golden Age. Few accounts go deeper than ‘most people agree he was a great batsman’. There are tantalising hints about their stroke play sometimes framed by the tactics those shots were a response to. Or ‘he bowled this and that with an indiscernible difference to his action’, but few detailed explanations of how turn, cut or swing was achieved. Hitherto the curious had to piece these tiny fragments together like the Medieval Scholastics trying to get at the meaning of Aristotle, but now we can test theories against the evidence before our eyes in T20 and in certain stages of other forms of the game. Some years ago, near Petersfield, some enthusiasts built and lived in a reconstruction of a Bronze Age settlement. (They may still be there worried about the encroachment of Iron Age developments.) There have been the programmes recently following a small group of historians recreating life on a Victorian farm. These experiments are valuable, probably more valuable to the inexperienced than to the expert as they connect with enquiring minds but valuable nonetheless. The shot played yesterday by the younger McCullum helped win a match, showed with intensity the timeless battle between batsman and bowler but also recreated and made knowable the sensations of a great era. T20 may have artificial restrictions but all games are tussles with restrictions. 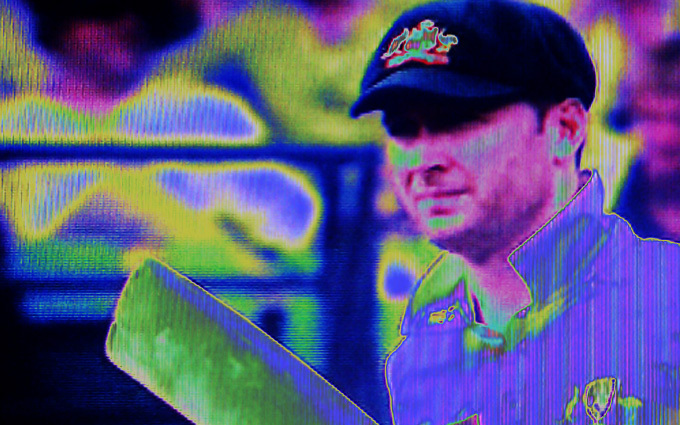 It is just that new restrictions give birth to new different tactics and those of T20 are producing similar mutations to those engendered a hundred years ago. Through this shot by McCullum in Guyana in April 2010, we were transported for an instant or two to Sydney in December 1904 and could see Trumper scoring 185 not out three hours fifty minutes with 25 boundaries. Simultaneously it brought New Zealand back into a game they appeared to be losing. The next shot, another yorker, McCullum managed to force to deep mid-on. Only a single, they nevertheless ran for two to the puzzlement of the commentariat as they failed to grasp why Vittori had spurned the strike and removed himself from the action. But this great captain knew that it was better for McCullum to have the strike than he. He gave his wicket and with it blessed his young partner who, no doubt inspired as he was meant to be by this piece of captaincy, slammed the next ball for six to win the match. There are other good things to revel in when watching this form of the game. All the things we love are there just born of different matter. Not least among these is playing for your country which Third Man believes will make this tournament dwarf that of Lalit Modi.